It starts its journey at the mouth. You chew your food so it can go down your throat into your stomach. 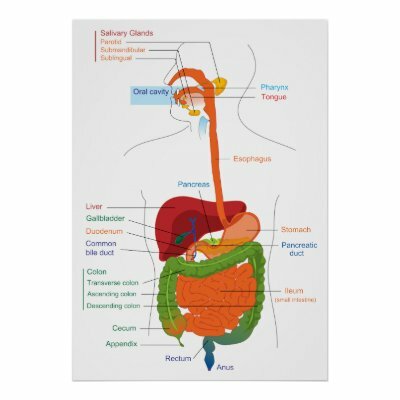 In the stomach it mixes with stomach acids which break it down into smaller pieces then it goes on to the small intestine which is where it takes out the bit that your body wants and the bits it doesn't. The bits it doesn't want go into the large intestine where they are kept until you need to go to the toilet but the bits it does want travel all around your body to where it's needed.